Housed in a beautiful Grade II listed Victorian building, St Bride Foundation was originally set up to serve the burgeoning print and publishing trade of nearby Fleet Street, and is now finding a new contemporary audience of designers, printmakers and typographers who come to enjoy a regular programme of design events, workshops and access to internationally renowned collection relating to printing, publishing and graphic design in the Print Library. The facilities at the St Brides Foundation are amazing. 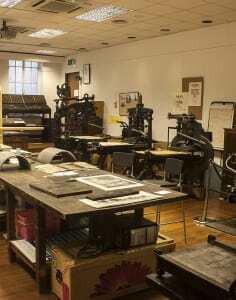 So much history and knowledge in the printing workshop, it was a pleasure to experience the surroundings and have a practical go using the amazing collection. Great class led by two experts in the field. Thoroughly enjoyed the course but felt like they could fit more into the full day course. Nice to learn an old technique and find out lots of interesting facts which all tie back in with current day design. Would recommend! This is the best thing I’ve ever done! Mick has a wealth of experience and expertise with metal type and the printing industry and is fascinating to learn from. I would highly recommend this course.